Each time we release a new Ensemble collection, we spend a lot of time considering which yarns could be substituted for which patterns. While at first glance it might appear that a dk is equal to another dk, or a worsted to another worsted, the unique nature of how we make Bare Naked Wools’ yarns actually makes the process a bit more in-depth. Gauge across the board translates well from yarn to yarn in our lineup, but each yarn creates a unique fabric all its own. We thought that before launching into another week of patterns (most specifically, the sweater patterns we know you have been waiting on), it would be good to discuss how the yarns develop and influence the garments in which they are featured. We’ll start with three and add some more after the next round of pattern releases. Kent, in both weights, made a lot of appearances in this year’s Ensemble. You might even say that it’s “having a moment” with our designers. This two ply blends Merino and Romney wools – one for softness and squishability, the other for shine, strength, and enhanced stitch character. When working in Kent, you know that what you make will last and look beautiful for a long time. The wide range of colors available, from creamy white to dark chocolate brown, made Kent a surprise favorite for colorwork in patterns like those from the Snowy Evening Woods set. It was also featured heavily in garments, including Anne’s extensive Herringweave pattern and in upcoming Minato. One of our favorite features of Kent is it’s chameleon-like ability to work wonderfully on a wide range of needle sizes. Kent DK can be used as a light worsted, dk, or sport, while Kent Worsted can fill out aran or knit at a tidy, tighter DK gauge. The first release of our collection, Volta, had us sold out of some colors in Cabecou Sport in no time flat. Just as beautiful in real life as in photos, Cabecou has a richness and shine to it from the mohair content. This yarn is relaxed, with drape that enhances shawls and results in effortless-looking, high-quality garments. This yarn also blended surprisingly well with Kent DK in Urbanza. While some of our other wools might seem to heavy for warmer climates, Cabecou’s unique blend of mohair and wool allows for larger than average gauge. This versatility allows Cabecou to be knit with more open space, resulting in lighter garments that allow the halo to lift from the finished fabric. While it’s a joy to knit with this yarn, the true joy comes with repeated wear – Cabecou garments actually look better with time as the halo can fully develop. The yarn that started it all. Better Breakfast was our first Bare Naked Wools yarn, introduced in our very first club. Spun up on the dream that you, our dear readers and followers and clubbies, might want a yarn that was as true to the fiber as possible, without alteration or interference. This yarn has a wonderful range of color due to the content – local Ohio de-haired alpaca, blended with soft Merino wool. Paired with multiple plies and a tight spin, this yarn is everything knitters dream of: softness, durability, and a squishy hand that even makes knitting swatches pleasurable! 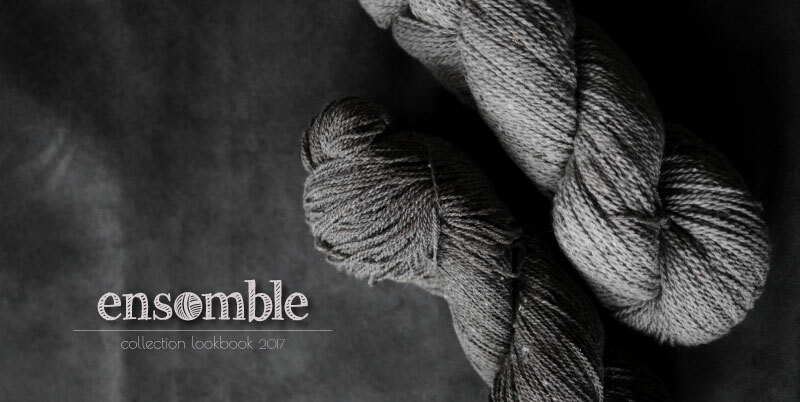 Available in multiple weights, this yarn was featured throughout this year’s Ensemble collection, in accessories like the Minstrel Shawl or Abri Hat and Cowl to the gorgeous Rocky Fork Pullover; designers just love its velvety depth. 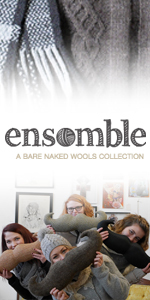 We hope that you’re enjoying Ensemble as much as we are this year, and will try some of the patterns in the yarns for which they were intended, but also experiment and step outside of the box. We encourage your substitutions – our yarns are created to meet the needs of knitters through the creation of soft and luxurious garments. No chemicals, dyes, or harsh processing, so the resulting fabrics are durable and give you the true character of the fiber. As always, our yarns come from animals that are loved and doted on, and our mills understand and appreciate their materials. Each yarn is carefully constructed and much thought is put into spin, hand, and content. For knitters, by knitters! Thank you for this post. 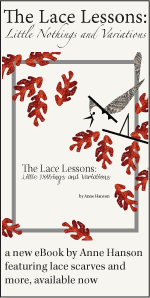 I enjoy reading about the many different fibers and yarns we love to knit with. Looking forward to getting some of your yarns in 2017.